Winning a water balloon fight takes two main components- speed of balloon filling and accuracy of throwing. Since there’s little we do gadgetwise to help your girly-armed throwing, let’s work on the filling part. 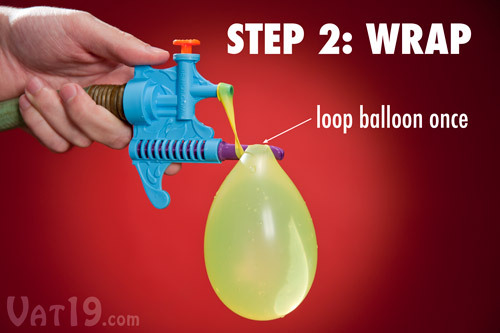 With the Tie-Not you can fill and tie off water balloons in record time. Just attach the device to edge of your hose, slip the balloon over the nozzle, press and fill with water, then slip the balloon off the nozzle and twist around to tie it off in one easy motion. You can tie the balloon in less than 5 seconds. It’s that easy. Just $9.95 and it includes 100 balloons to get you started.